The Quebe Sisters performed in Harro East Ballroom on Saturday as part of the 2017 XRIJF. Other than the meteorological mind games the clouds played with our heads, it turned out to be a beautiful day as we traipsed the jazz fandango well into the night. Ron Netsky knows what I like and immediately insisted I check out Grace, Sophia, and Hulda, The Quebe Sisters. 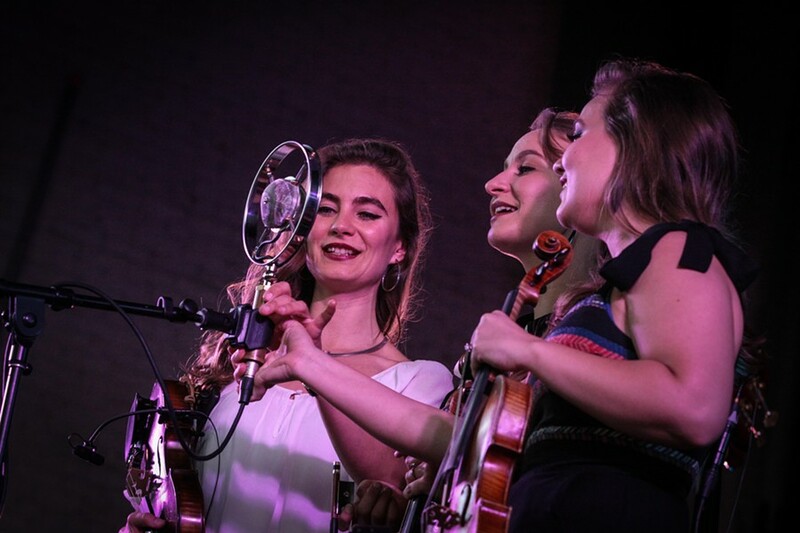 These three fiddle-wielding young women from Dallas sang like absolute angels -- or more accurately, The Andrews Sisters ... or maybe The Del Rubio Triplets. Their music had that cozy yesteryear feel of those wartime-era three-part harmonies, harvested, picked, and re-planted in Western swing dirt. The songs were plaintive and refined, allowing the sisters' vocals to haunt and wreak heartache, lyrically and melodically. They pulled out a handsome take of Hank Williams' "Cold, Cold Heart," Johnny Cash's "Wayfaring Stranger," and a killer stab with the sweet sawing of their bows on Les Paul and Mary Ford's "How High the Moon." So I've decided I'm going to have The Quebe Sisters play my funeral. (I had initially had Popeye booked for the ceremony, where he and Olive would do a little interpretive dance to Santo & Johnny's "Sleepwalk.") The sisters were enchanting and even a bit shy with funny anecdotes about the songs or the latest haps in their young career, like recording with Willie Nelson or hangin' with Asleep at the Wheel. The Quebe Sisters will perform again Sunday, June 25, at the Xerox Auditorium (100 South Clinton Avenue). 6:30 p.m. and 9 p.m. $30, or you can use your Club Pass. quebesisters.com. This just in: Frank De Blase defines the word "show" as something you're missing while you live stream the event with your goddamn cell phone. Holster that smoke wagon, and enjoy the show like the rest of us. Adam Wakefield shocked and awed the crowd, opening the show with a piece on the grand piano all by his lonesome. It's not that the Anthology crowd didn't think he could play piano, we were just expecting some loud, bordering-on-outlaw country -- which we got when the rest of his band took to the bandstand. With a penchant for 1970's, Waylon-style flanger, Wakefield plays that kind of country that wraps the cliché in the honesty of a song well-written and ultimately well-played. The crowd ate it up. But don't sweat the redneck appearance; he hails from New Hampshire. Oh, and speaking of eating it up: Wakefield first came to national attention on a talent show where country singers are thrown in a pit of alligators as celebrities judge their performance. Winners are spared and given a recording contract. Now, Wakefield didn't win, but I couldn't help but notice his slick alligator boots. Adam Wakefield won't perform again during this year's XRIJF, but check him out at adamwakefieldmusic.com. Tomorrow, me and my alligator shoes will be checking out English slide wizard Jack Broadbent at Montage and John Paul White of the Civil Wars at Anthology.